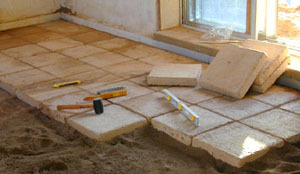 Adobe block floors are among the lowest cost, all natural, easiest to install floor options. Readers often ask our advice about the most practical floors for do-it-yourselfers. If you’re building your own sustainable home, I suggest building floors on grade. This eliminates the need for posts, beams, floor joists, subflooring, toxic glues and other materials used to build typical wood framed floors. Be sure to check out our previous blog post about Eleven Earth Floor Methods. 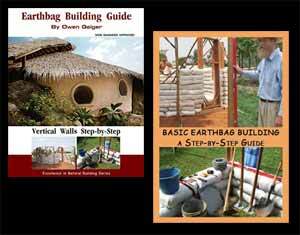 This is perhaps the best overview of the various ways of making earth floors. There was some talk about climate. Does this floor work well in a climate like Montana (down to minus 20F in the winter, up to 100F in the summer)? Would a partially buried home improve performance of the floor dramatically? I would think yes. Add insulation under the floor in cold climates. I like to use 12″ or so of lava rock plus moisture barrier. Consider adding radiant floor heating (PEX) under the adobe floor. Earth berming and earth sheltering will improve energy efficiency. So to summarize: CEB’s or adobe blocks on top of sand, on top of a poly barrier, on top of 12 inches of 1/2″-3/4″ diameter scoria. Yes. Also note, there are lots of articles on the Internet that talk about setting recycled brick floors on sand. You can use the same general advice they provide when it comes to leveling, etc. or even use recycled bricks if you want. Brick and stone are best for entryways and bathrooms. Thanks I hadn’t thought about the high traffic areas but was pondering bathroom issues. So baked clay brick in the bathroom and CEB’s or adobe are good for most everywhere else. Throw in some Hydronic underfloor heating for lower heat requirements and looks like you are good to go. Yes, you’ll want to use underfloor heat in your climate. Not only is this the most efficient method, it’s also the most comfortable. The floor is always warm on your feet. The air temperature from the floor to ceiling is uniform. No blowing fans/noise/dust. Sketch your room measurements and take to radiant floor heating suppliers for free bids. Any DIYer can install the PEX tubing. You’ll probably want to hire a company to install the main controls and make the final connections. Be sure to provide adequate space in a laundry room, etc. for the controls. A central location is best. Scoria can be hard on plastic. It can poke holes in the plastic very easily. I recommend covering the Scoria with something before laying the plastic on top of it. There are many possibilities, but a layer of old carpet scraps works very well, and can be found for free almost everywhere. Don’t be afraid to cut a big carpet up into smaller easier to handle pieces and overlap them under the floor. Small ridges won’t hurt the plastic and the sand layer will allow you to smooth everything out flat and level. Then again, if you have lots of helpers, leave it as one big carpet and roll the whole thing out over the top of the scoria. Then lay the plastic sheeting, sand, and flooring. One additional thought to make such a floor perform even better. 3) add moisture barrier of 6 mil plastic sheeting – “6 mil poly” – to prevent wicking of moisture. That moisture barrier can also be a vapor barrier and also part of a full bubble of air barrier. For highest energy performance and maximum air sealing, let the plastic on the floor run long and extend beyond the edges of the floor for an extra foot or two without cutting it off. Then, connect that plastic sheeting in with a vapor barrier in the walls with caulking. Once connected and sealed, all this gets buried in the floor and walls under the finished flooring and plaster layers. Do the same thing to connect air barriers at the wall to ceiling intersection. Yes you can pour adobe to make the floor instead of using bricks. This works particularly well if you live in an area where drying the bricks outside may be a problem. I poured an adobe floor two years ago. It was 6″ thick and took one week to dry well enough to walk on. Under the floor was a 4″ layer of rammed lime-straw on top of a thick bed of pea gravel. The floor was finished with many coats of lime plaster and has been worked well with no problems in the last two years. It’s good to have numerous options so you can choose the best one for your climate and design preferences. Poured adobe works fine in dry and moderate climates, but can take months to dry in colder humid areas. This can greatly slow construction on the rest of the home. One option is to fire up a stove or heater if necessary to hasten drying. Also note, you can dry adobes and CEBs outside under cover (open-air shed, etc.). And just to be clear, I’ve always considered earthen floors to be the lowest cost, most practical method of making floors. Agree they are “dirt” cheap. Now use that same thinking to build a complete dirt cheap home. Yes, but like I said they take a long time to dry. It seems easier and more convenient to make adobes or CEBs as time permits, let them dry and then use as flooring. The adobe block method described above is very similar to the CEB method described by VelaCreations (very popular). Poured adobe floors look great — super beautiful — but can take months to dry in humid climates. Setting CEBs or adobes in sand is way faster. Solar Haven used 1″ polystyrene (EPS) under the floor along with PEX tubing radiant floor heating. Interior stud walls are filled with straw/clay. So it’s OK to put hydronic under the adobe or CEB’s? What would be the effect on the overall system? You would have a lot of thermal mass but would it take more energy to heat it or would the heat be very slow to bubble thru the floor? In terms of energy efficiency, radiant heating in a thermal mass floor is ideal. The Solar Haven floor is one of the lowest cost, most natural, fastest, easiest, most energy efficient floors I can think of. If you’re using radiant heat (hydronic) in the floor then make sure there’s insulation underneath. The thought was to use scoria. Cheap in bulk so I cut put several inches plus it won’t rot or offgas. Use about 12″ of cleaned scoria about 1/2″-3/4″ diameter.